The Krowne D2712 drop-in ice bin will provide your behind-the-bar operation with 73 pounds of ice storage for keeping customers' drinks cold. The two-piece sliding cover provides servers and bartenders with easy access to the unit's contents, and full insulation helps keep your ice from melting. Installation for this model requires a 251⁄4-inch by 181⁄4-inch cutout and one-inch IPS drain connection. 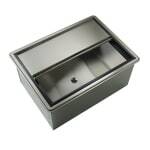 The Krowne D2712 drop-in ice bin comes standard with 20-gauge stainless steel construction.